VALUE INNOVATION Quotes. 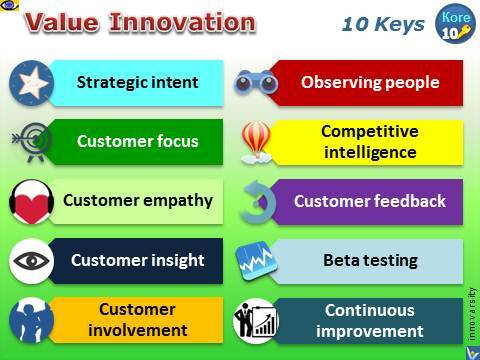 How To Create Innovative Value for Customers. 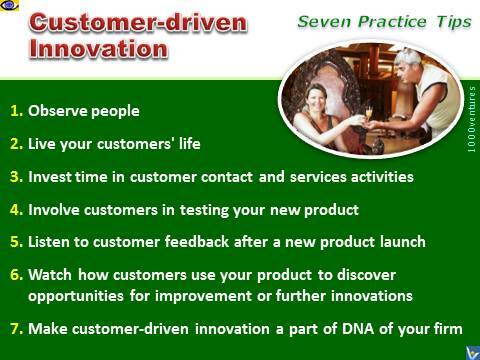 Innovation Management, Customer-driven Innovation. 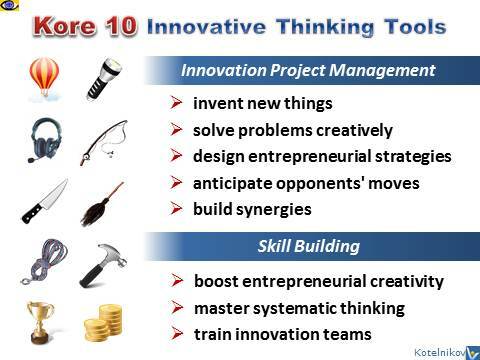 Innovation Strategies of Leading Companies. Amazon.com, Google, Ten3 Business e-Coach, Vadim Kotelnikov. 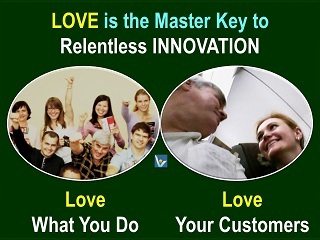 Innovation Is Love. Develop a strategic intent aimed at amazing customers with new highly beneficial solutions, and communicate this strategic intent to all employees continually. We want to build technology that everybody loves using, and that affects everyone. We want to create beautiful, intuitive services and technologies that are so incredibly useful that people use them twice a day. Anything that won't sell, I don't want to invent. I am very fond of strawberries, but fish prefer worms. So when I went fishing, I didn’t think about what I wanted. I thought about what they wanted. I didn't bait the hook with strawberries. Rather, I dangled a worm in front of the fish. Microsoft is a company that manages imagination. 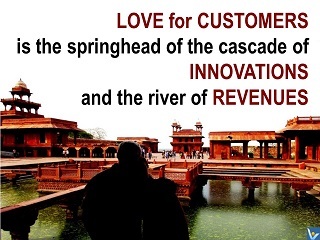 Company's vision must be driven by the aspirations of its customers. Don't sell customers goods that they are attracted to, sell them goods that will benefit them. It's customers that made Dell great in the first place, and if we're smart enough and quick enough to listen to customer needs, we'll succeed. Infosys has laser focus on customers; Infosys brings customers into its premises, into our software engineering and technology lab, so that we can serve our customers better. Exceed your customer's expectations. If you do, they'll come back over and over. Give them what they want – and a little more. Let them know you appreciate them. Our DNA is as a consumer company – for that individual customer who’s voting thumbs up or thumbs down. Our job is to take responsibility for the complete user experience. And if it’s not up to par, it’s our fault, plain and simply. The job can't be finished only improved to please the customer. 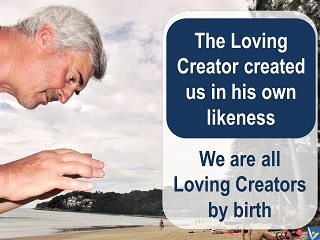 We go to the source. Not the "experts" inside a company, but the actual people who use the product or something similar to what we're hoping to create. It's precisely this observation-fueled insight that makes innovation possible. The primary purpose of leadership is to give your customers the ability to do what they can't do, but would have wanted to do if only they knew they could have done it. I will never put my name on a product that does not have the best that is in me. I used to call this 'Users, Not Money.' We believe that if we focus on the users, the money will come. In a truly virtual business, if you're successful, you'll be working at something that's so necessary people will pay for it in subscription form. Or you'll have so many users that advertisers will pay to sponsor the site. Competitive companies constantly look for ways to change every aspect of their business. Then, when they've found them, they make sure that they translate those changes into advantages customers will appreciate and act on.